Sweet Jesus. A friend of mine said this picture existed and here it is. I’m not quite sure how to comment on such a photo. Instead, I’ll give you Texans a moment of silence much like the one I had when I first saw it. Such a thing gives pause. I was a Texan once for two years while my daddy coached at Austin College. Fine place, Sherman, Texas, and I have many fond “tween” memories there that involve writing my first column in the school newspaper, pouring boiling water on tarantulas, breathing my first dust storm, and falling deeply into forever-love with a blonde-haired boy named Bob something. That kind of makes me a Texan, at least in a fleeting, cootie-catcher kind of way. My fellow Texans, I strongly urge you all to gallop to the precinct polling places tomorrow and place your votes for Mike Huckabee. If he quits campaigning he’ll be out of a job and that means he and his familial entourage will be back in Arkansas. Oh my. Besides, a vote for Huckabee is a vote for a Democratic candidate, in a roundabout, cootie-catcher kind of way, and that’s perfectly fine by me. If any of y’all run into Bob what’s-his-name, tell him my love has not diminished. Please God tell me that’s not a recent photo of the former first family… The son in the middle looks a little touched…by too many twinkies. 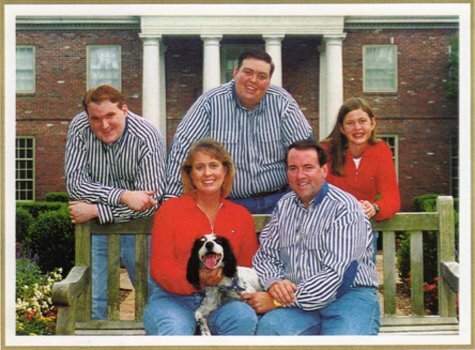 I thought Huckabee was all about losing weight, feeling great, and ruining the lives of countless kindergarteners in Arkansas by crushing their hopes of purple-and-blue cupcake-lunchroom-birthday parties. No, it’s not recent. And the son in the middle IS a little touched. I believe he was arrested last April at the airport for carrying a gun, but that’s nothing compared to his shenanigans when he was younger. Google “huckabee” and “boy scout” and “dog mutilation.” Go ahead, I dare you. See, that was the pause I mentioned.